We are wrapping up our first tour this morning. It has truly been a trip of a lifetime with great people and great photo opportunities. Ireland is indeed beautiful. 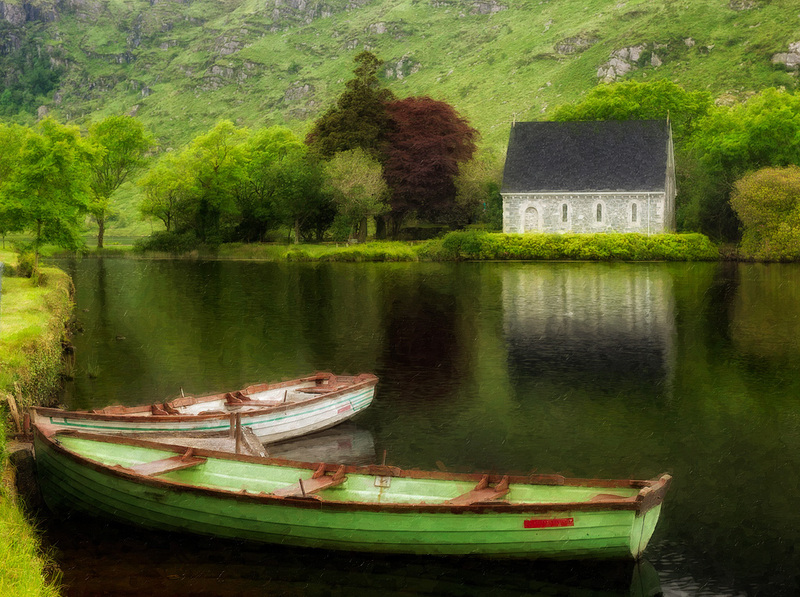 Today’s blog image is from our stop last night in Gougane Barra. It is a small church that sits on the edge of a beautiful lake. The light could not have been nicer. For processing, I decided to use Nik’s Glamour Glow filter and then add Alien Skin Snap Art impasto for a painterly look. What a beautiful scene….you must know someone that docked the boats for you..Gorgeous! Winner!! You could not wrap it any better with a bow. Great parting shot!! Feels like I’m there!! Wonderful image John. Love the composition and the feeling it evokes. And this shot ought to be in Nat Geo’s 2012 Travel Calendar! Great shot John! Wow!!! Great scene. And excellent application of tools. What a beautiful scene and capture. Gorgeous! The green really says ‘Ireland’!